Earlier this week the Mother and Toddler group we go to celebrated Saint Davids Day by throwing a big fun day event. There was a bouncy castle, sports and craft activities, songs and story time all in Welsh or with a Welsh theme. It was a fabulous day and the turn out was great as the nursery class at the local Welsh primary school (that my children go to) was invited along with the Cylch Meithrin (Welsh pre-nursery group) that I used to work in. Not long after we got there O was ‘adopted’ by two little girls from the school who held his hand and walked around with him pretty much for the rest of the event! It was so sweet, especially when they were both asking him ‘are you a boy or a girl?’. After three hours of constant bouncing and playing I was actually surprised we got home with him still awake but as you can see by this picture he didn’t last too long before he finally keeled over! I tend to do this when watching a film. 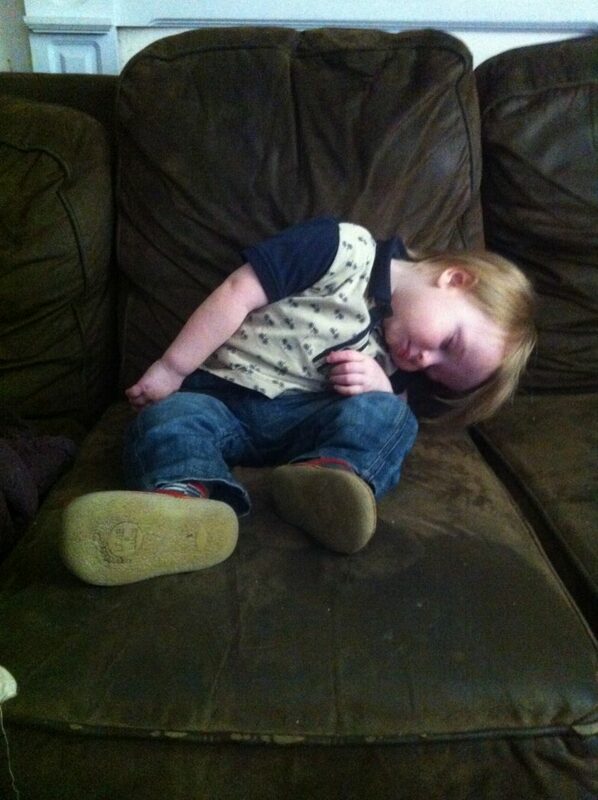 He obviously had a very fun day. Lisa (mummascribbles) recently posted…How our weekends have changed! Mim recently posted…My #mamamimmention this week – The Determined Housewife!